What a stunning week! Back to camping at the beginning of the week saved a bit of money (which is good as I’ve just taken the plunge and bought a new tent, yikes!). I have not walked as far this week as my priority has been sight-seeing; I’ve now seen the parts of Northumberland that have been on my list for a while. 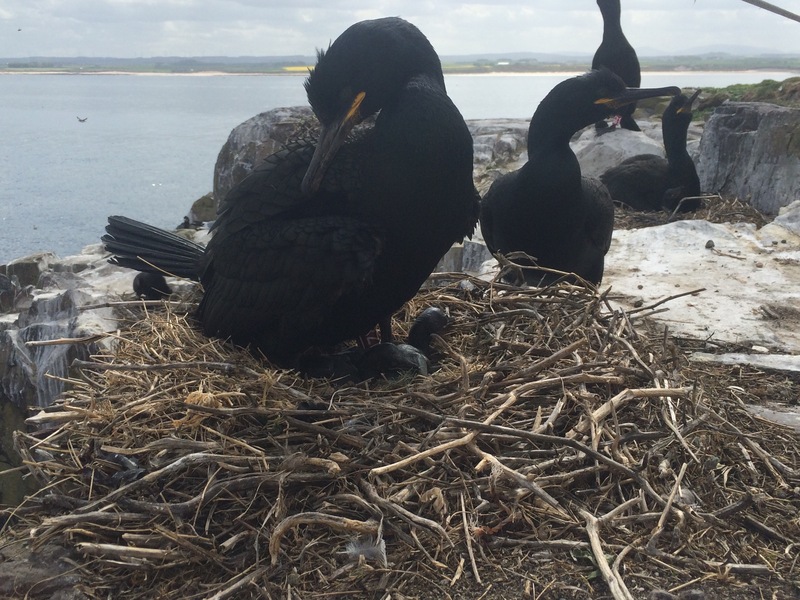 And I’m so pleased I have seen them because the Farne Islands and Holy Island in particular are fantastic places to visit; so beautiful and so much wildlife and history. 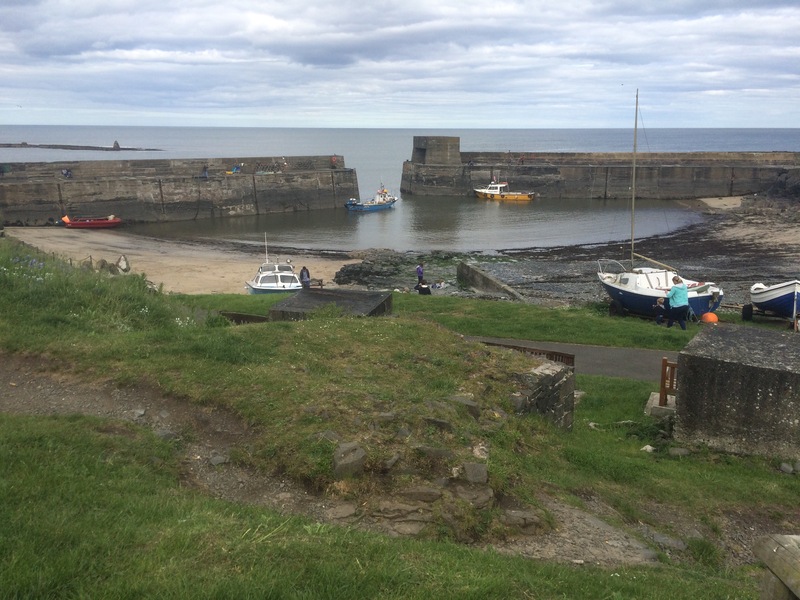 My main frustration of the week was the lack of phone reception and wifi in Northumberland. Doing this trip I am more dependent upon my iPhone than I have ever been (and than I like to be). I use it for accessing the Internet to plan, get the weather, find and book accommodation, not to mention take photos and write my blog. All of this requires a charged-up battery, and most of it requires Internet access. This is why I go to pubs so often, not because I need the alcohol but because I need to find a plug socket and get access to wifi. Three days without wifi this week put me behind in my planning, logging of photos, and blog writing. I have to say that I found this a little stressful and always felt like I was playing catch-up. Goodness only knows how I’m going to cope in N Scotland! Yet again I met some lovely people this week, was hosted by friends of friends who were amazingly kind to a stranger, and met up with an old friend. All this people made a very positive impact on my morale and encouraged me to keep going as I was having a few doubts about the wild parts of Scotland that lie ahead. I have been very lucky with the weather and can’t believe that I can see any places more beautiful than this week, but apparently there are more ahead! I am very lucky. 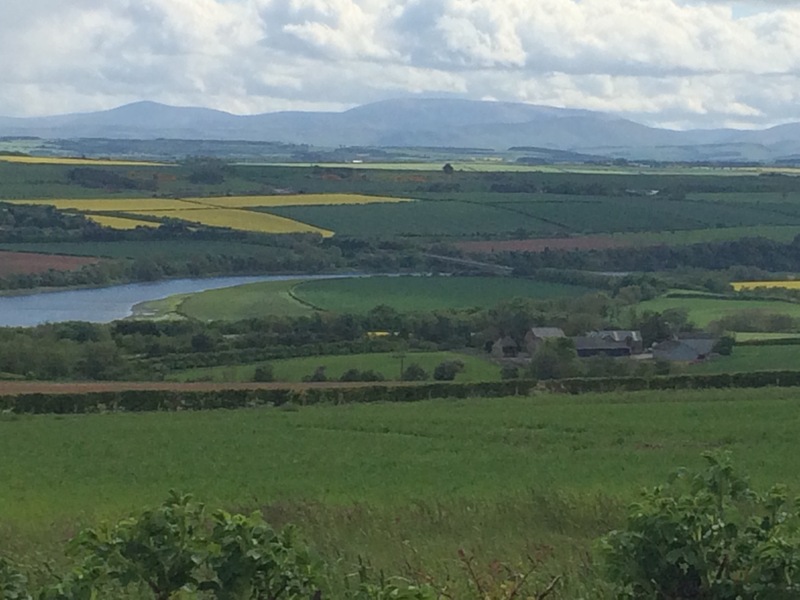 Is there anywhere more beautiful than Northumberland and the Scottish Borders on a sunny day? Nice to spend the day with old friends, get my washing done, eat lots…oh and do some exercise! 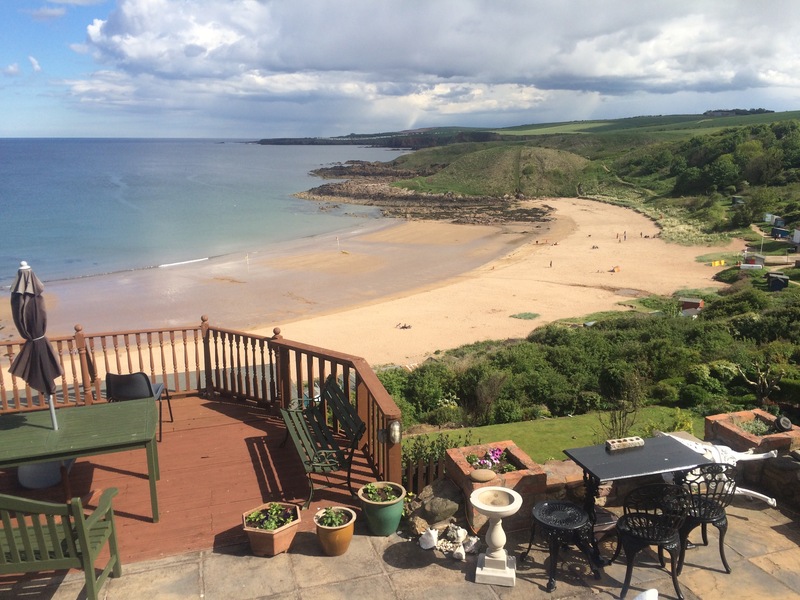 Another beautiful sunny morning and a wonderful view overlooking the beach while I ate smoked haddock for breakfast. I was late starting walking again as I was taking advantage of the wifi and trying to catch up with blogging and logging photos. The small town of St Abb’s was just around the corner and I stopped to have a look at another of the 1881 storm memorials and admire the view. 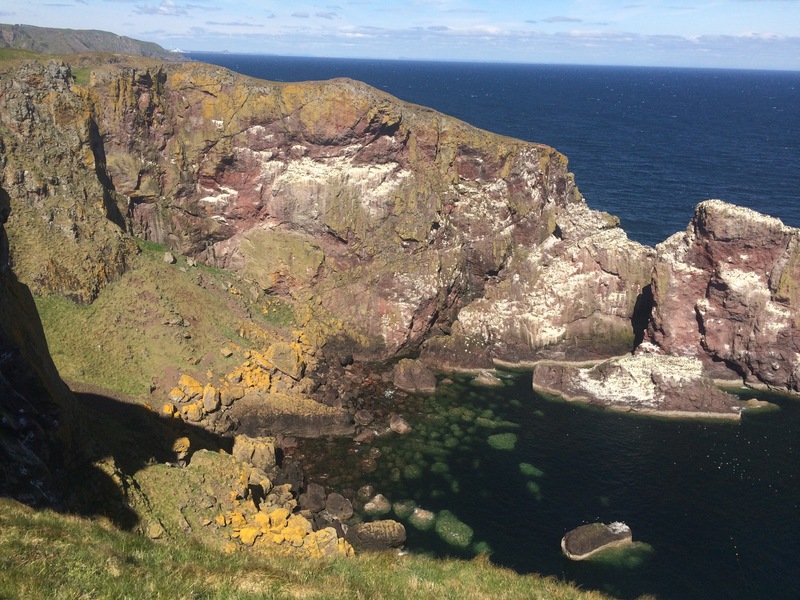 As I walked around St Abbs Head the wind became stronger, the ground steeper and rougher, and the views more magnificent. I passed the lighthouse right on the Head and then rounded the corner to a cliff full of sea birds. The walk today was ridiculously hilly, non-stop up and down some very steep slopes. In some places I had to zig zag up the grass cliff in front of me. The path was well signposted but perhaps it needs a health warning – fit people only! Thank goodness for walking poles! Looking ahead at all those steep ups and downs! 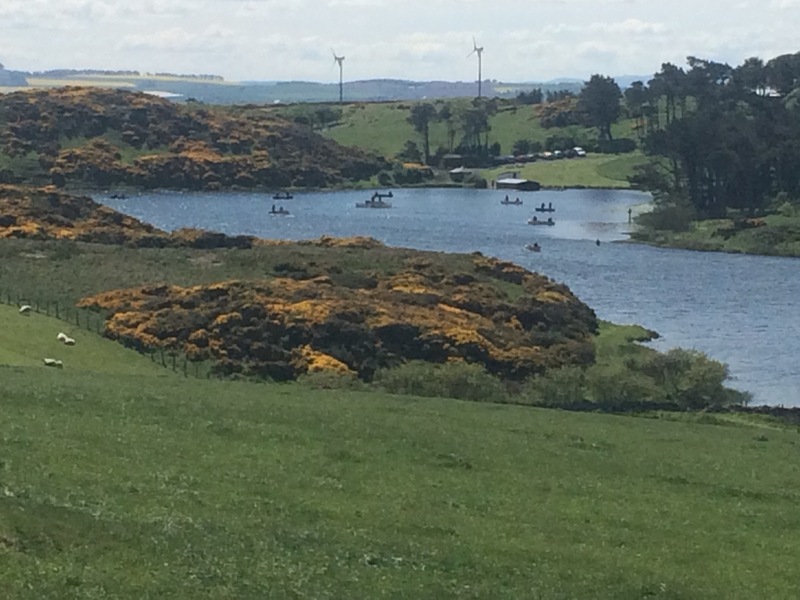 When I looked back I could see weekend fishing in canoes on the Coldingham Loch. 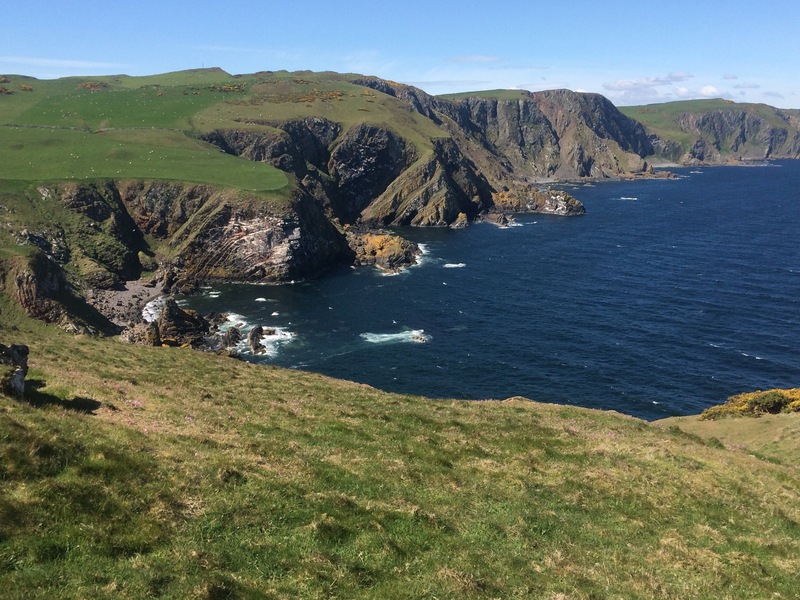 Another stroke of luck, after St Abb’s Head I only met one other person all morning and he advised me of the one place on the route where there was no signpost to direct you and the route wasn’t obvious. If it hadn’t been for him I’d have had a much longer walk with more road. The views were outstanding and I could clearly see Torness Power Station and right up to Bass Rock in the Firth of Forth. 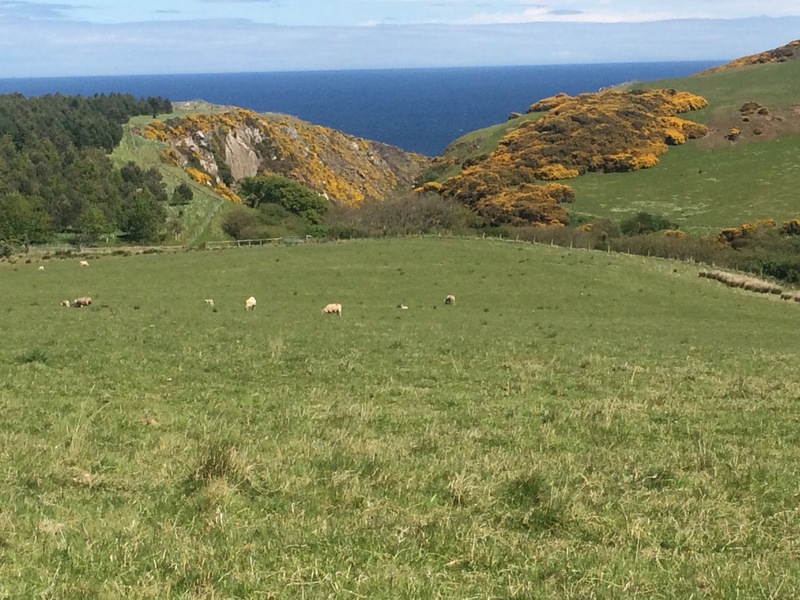 Most of the coast path seemed like sheep tracks, narrow paths along the cliff top, but it did head inland at one point and I had a quick break admiring the view with the sheep. By this point I was pushing the pace as I hadn’t been able to find any accommodation in Cockurnspath (no guest houses and no campsites) so I needed to catch the bus to Dunbar where I was hoping to find something. The only afternoon bus was at 16:44 and I couldn’t afford to miss it. I dropped down into Pease Bay and back up the hill, past the caravan site, and I was nearly there. In the end I reached Cockburnspath with 45 minutes to spare so I popped into the local shop for some well-earned sustenance. As I had time I decided to call my friend Ali, who lives in Edinburgh, to discuss when I would be arriving. 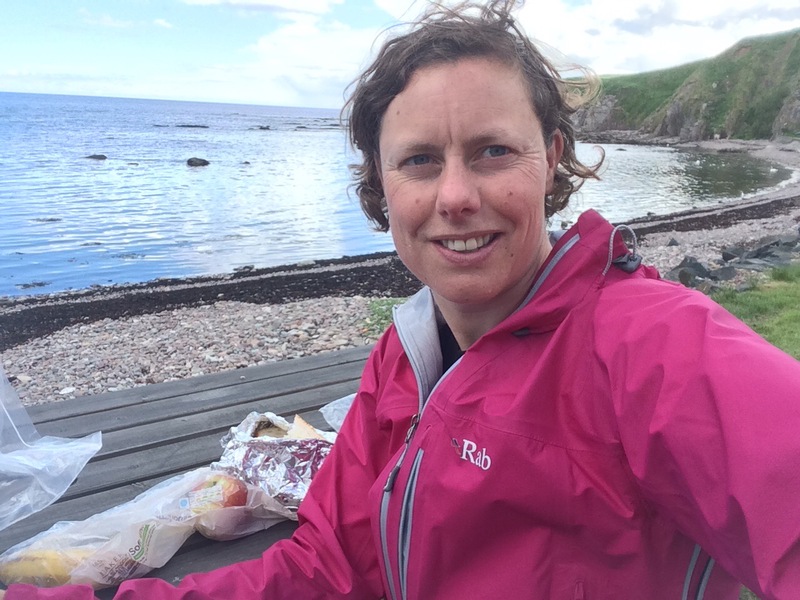 Another stroke of luck, she doesn’t live too far from Dunbar and offered me a bed for the night. Problem solved and I get to catch up with an old friend. Perfect. By the time Ali picked me up from the bus I had decided to take the following day off and spend it with friends. A great start to the day as Yvonne cooked me a Craster kipper, which I had missed out on in Craster. Delicious. She also made me a packed lunch. I could have stayed chatting all day but I had to get walking. Only 3 miles to the Scottish Border. I really liked Berwick and could see why Clive and Yvonne have decided to move from London to retire there. Somewhere else I’d like to come back to. 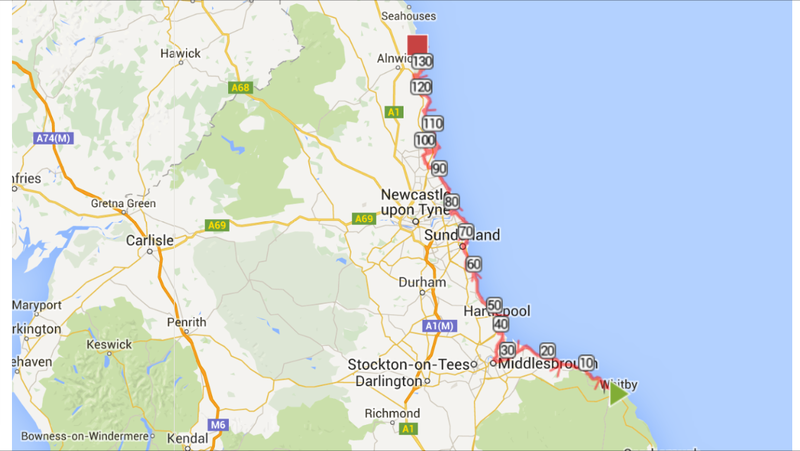 Berwick – there is a beach down there but look at how clear the sea is! Clive walked me through the town and along the walls to set me off without getting lost and then I was on the headland and heading for the border. 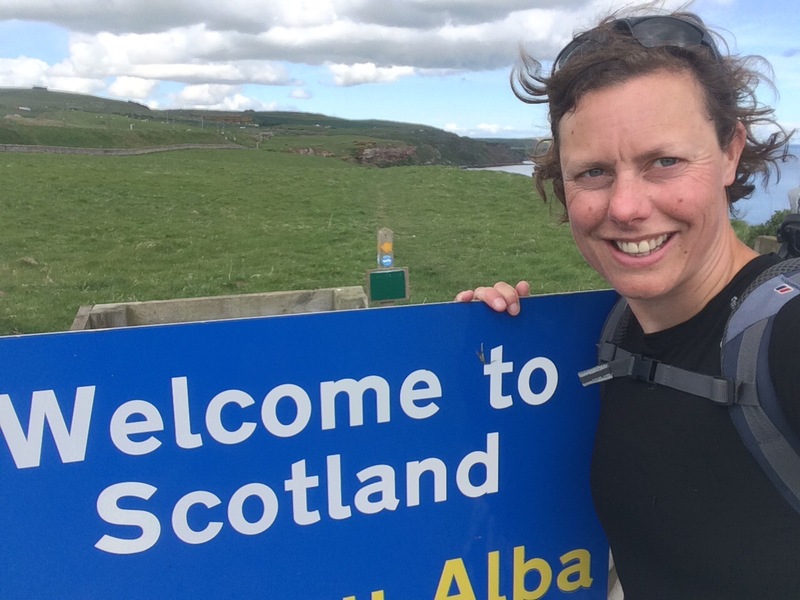 I reached the “welcome to Scotland” sign (there’s no “welcome to England” sign of I’d been coming the other way) just as a cloud came over and, as I took a photo of me at the border, it started raining. I hope that’s not a portent for the Scottish part of my trip! Fortunately after about 10 minutes the rain stopped and then it was sunny for the rest of the day. 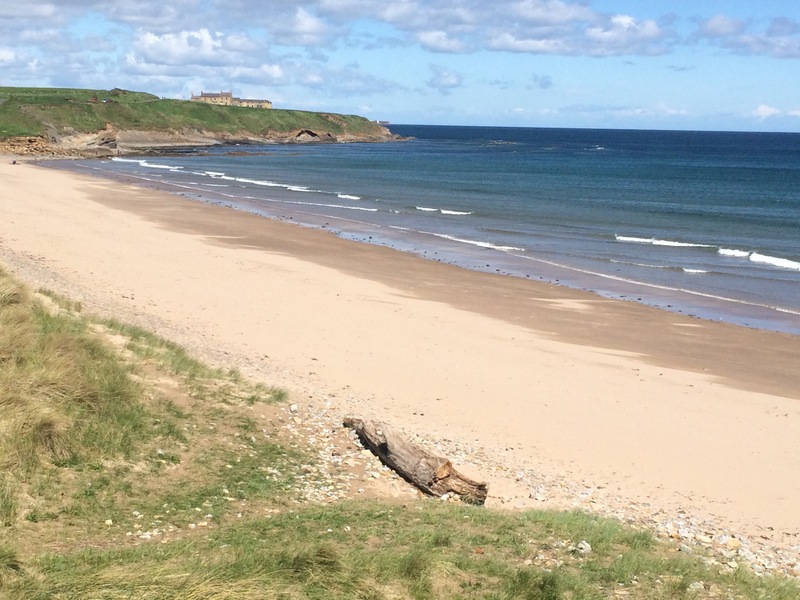 This stretch of coastline, from Berwick North, is all headland and rocky coves, most of them inaccessible. So beautiful. The sea was a deep blue and very clear. Every headland I walked around I had an intake of breath as I saw another cove that, rather impossibly, looked more beautiful than the last (I’m sure I would have felt exactly the same if I’d been walking the other direction!). Stunning; and so tempting for a swim. I saw plenty of fulmars that were nesting on the cliffs. Once in Scotland there seemed to be more flies and of course the coast path signs changed and were more consistent. 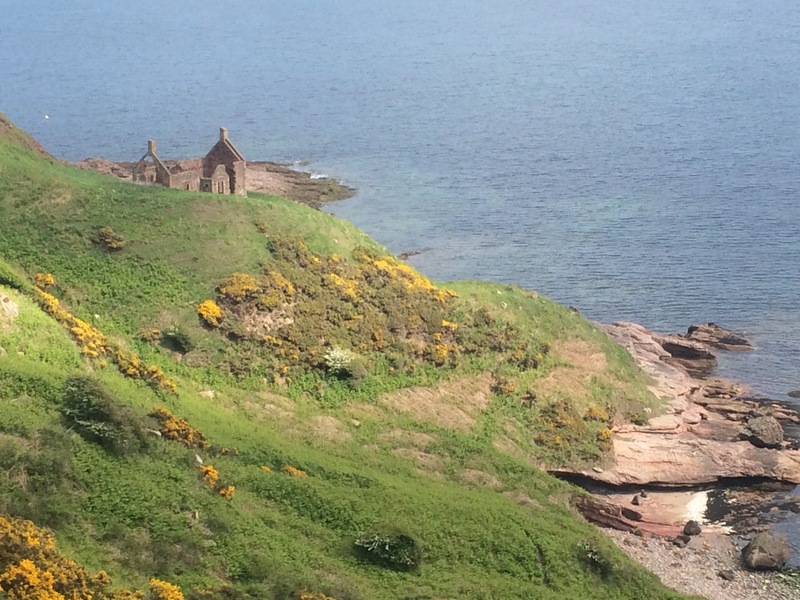 I passed a ruin of an old smuggler’s bothy on the cliff and then the path veered a field away from the cliff edge and next to the railway line. Suddenly the path signs sent me almost back on myself and headed for the cliff top. I almost tried to cut the corner and head across the field but I’m glad I didn’t as the path did actually go over the cliff (it didn’t look possible from 20 metres away) and suddenly there was a settlement on the sea shore below the cliff. Almost unbelievable. 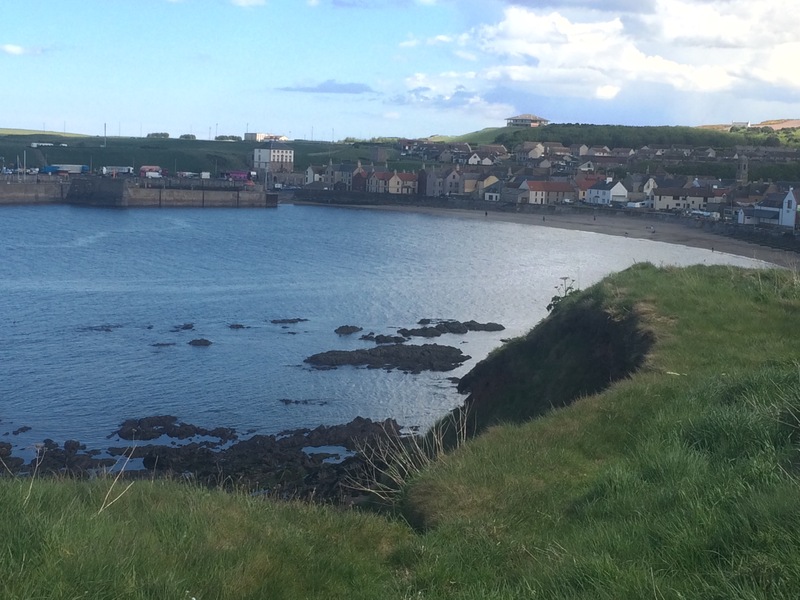 This was Burnmouth and a good place to stop and eat my packed lunch next to the shore. I can’t believe there are houses down there! 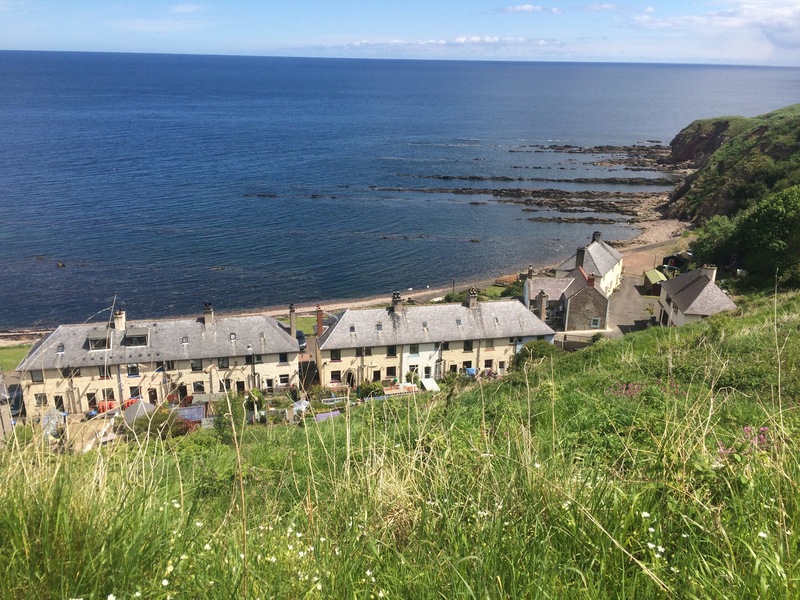 I walked through this tiny lower section of the town with its old harbour for fishing boats and up the ridiculously steep road to get out and head to Eyemouth. 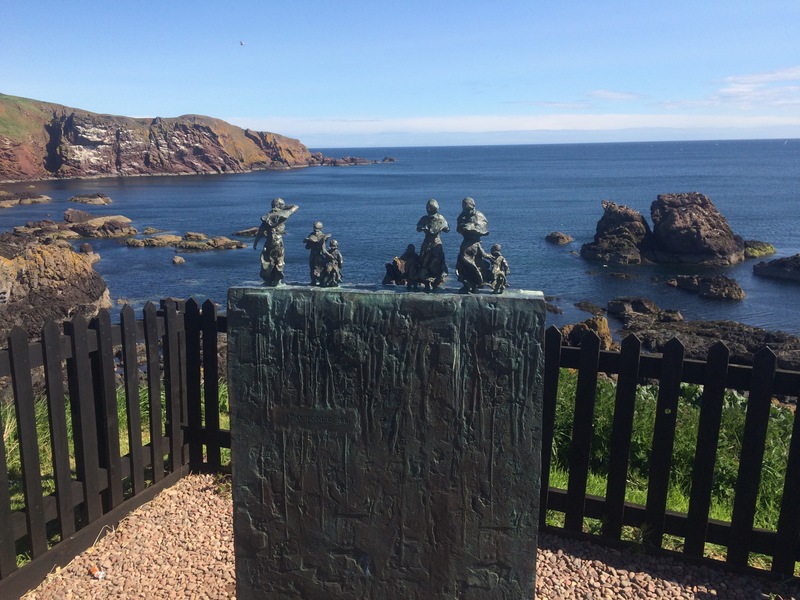 This area has a strong fishing tradition and both Burnmouth and Eyemouth had memorials to the 189 men who died in the great storm of 1881. 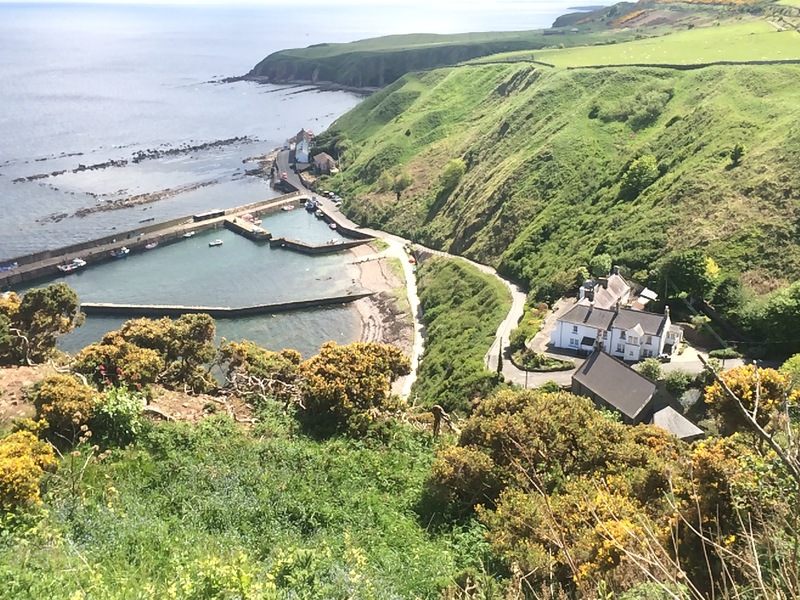 There is also a smuggling heritage and the large and imposing Gunsgreen House in Eyemouth was the home of the wealthy and pseudo-respectable smuggler John Nisbet. 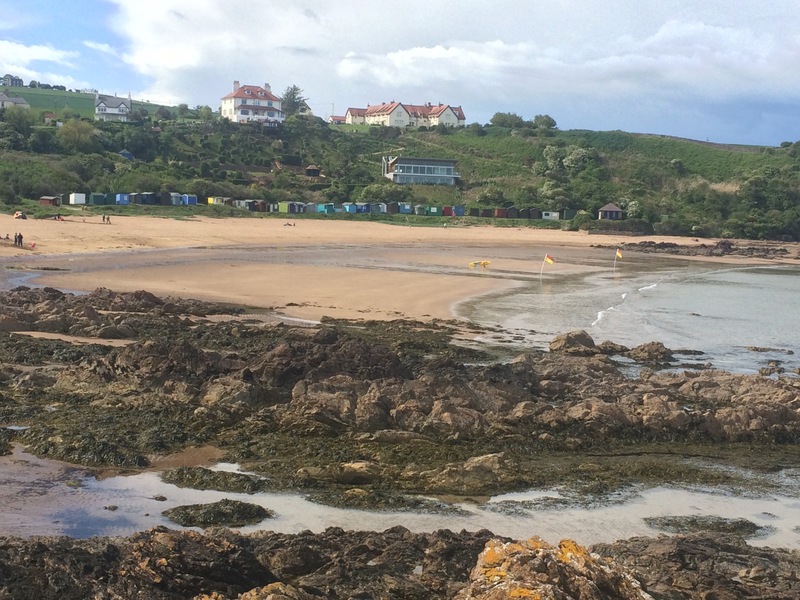 I stopped for coffee and cake and headed on to Coldingham. 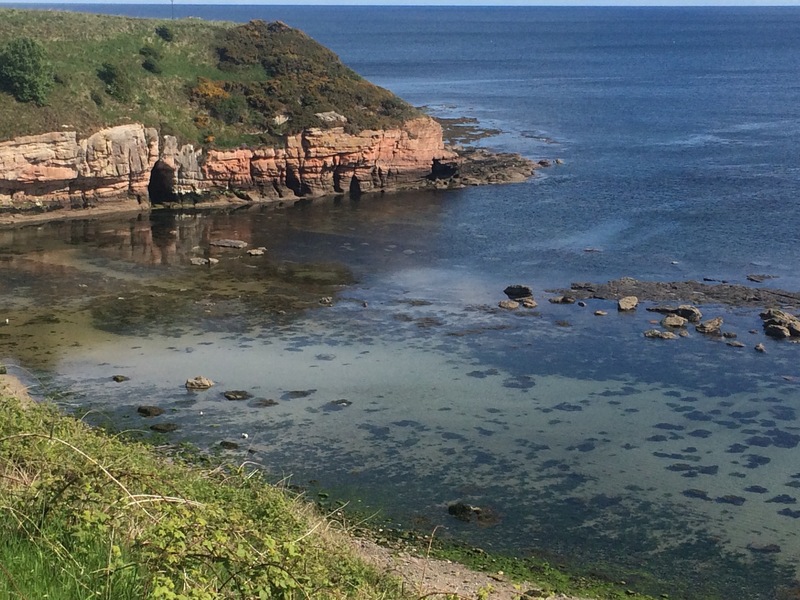 More stunning coves and then a beautiful little beach with Coldingham dribbling down onto it. This beach was the first I’d seen with lifeguards and swimming flags. Either the Scots are hardier or it provides more employment. My guest house was overlooking the beach and so it seemed natural to dump my stuff, do some quick handwashing, and then take a dip in the beautiful sea. It was cold. Lovely though. I managed 5 minutes and then had to come out because a crow was emptying my towel and clothes from the plastic bag they were in. Not far up the beach to a hot shower. I had dinner in the local St Vedas hotel that only does restaurant meals at the weekend. I was lucky to get a table as it is full with locals because the chef is very good. 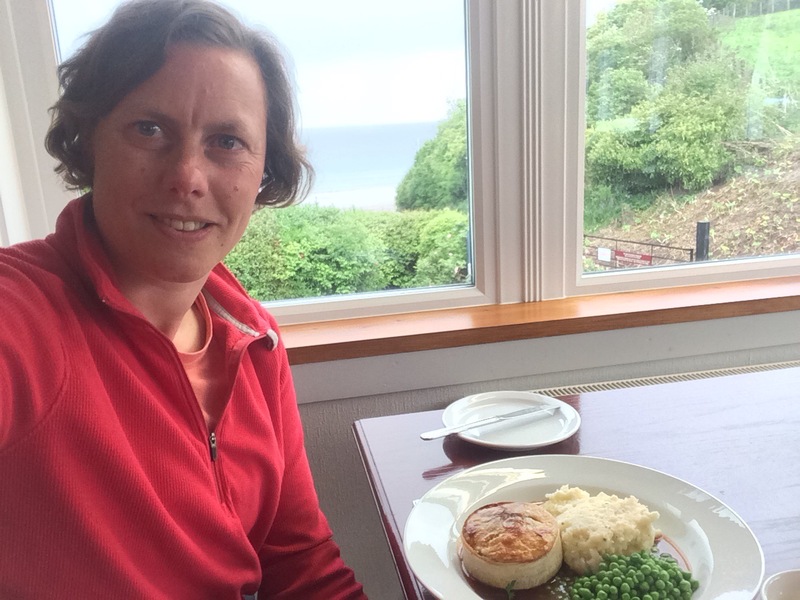 I had a lovely chat with a local couple over dinner and I treated myself to celebrate a great day, scallops and then an award winning scotch pie. Delicious. Scotch pie and a view! I survived the rain through the night and woke to another beautiful sunny morning. I had small tents either side of me and it was disheartening to see how wet my tent was compared to theirs. At least it showed that my tent struggles are not all my fault. That settled it, I need to buy a better tent. 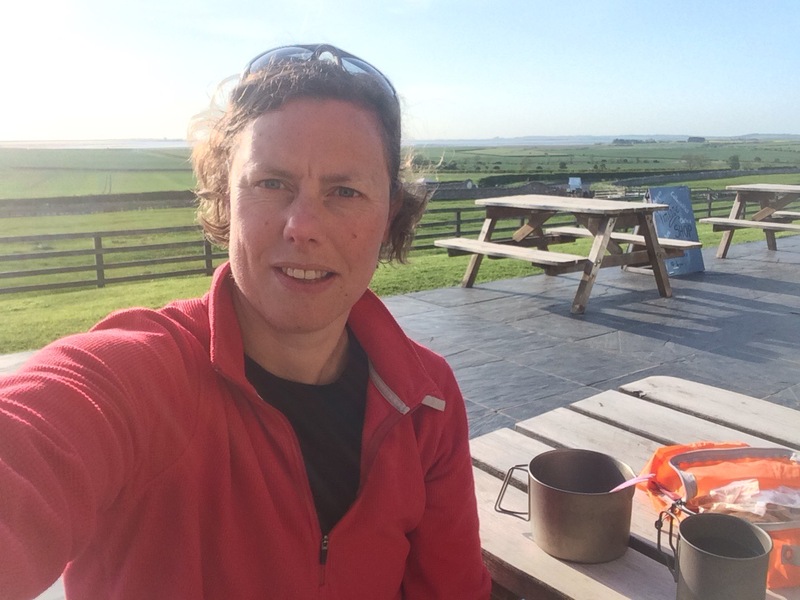 I eventually got the tent dry in the strong wind, made myself some porridge, admired the beautiful view and set off on the relatively short walk to Berwick. 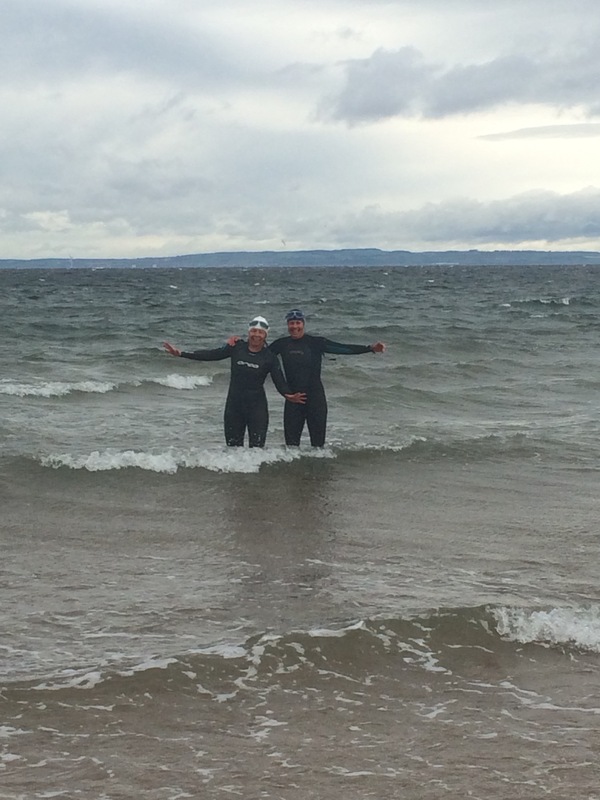 Although it was sunny, the wind was in my face and very strong, which made it quite hard going. Once past the marshy areas opposite Holy Island, I tried to walk along Goswick Sands but hadn’t taken account of the North Low River that flows out over the beach cutting it in two. I walked along looking for somewhere to cross but to no avail. I could have paddled if I’d taken my shoes and socks off, but as I was being sand blasted and struggling into the headwind I thought I’d leave the beach anyway in the hope of some shelter. 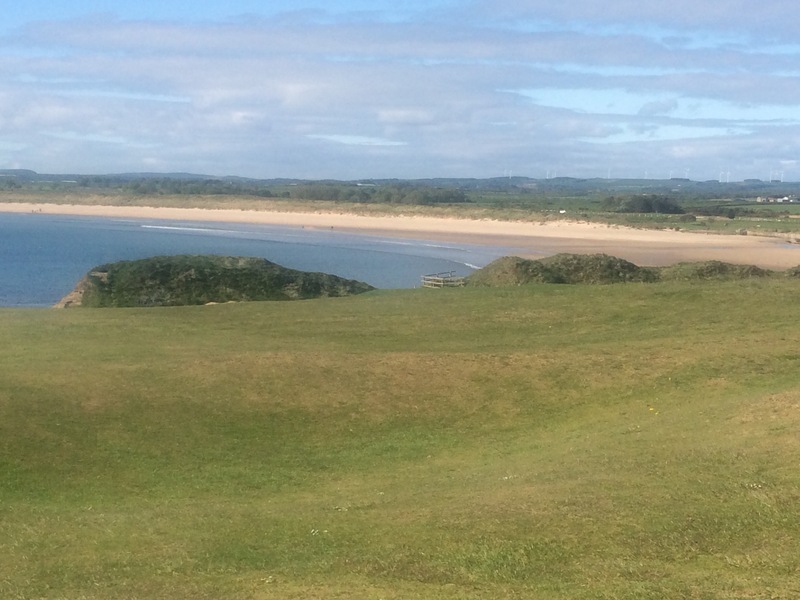 I ended up almost turning back on myself and then struggled to find a way through the dunes until finally I reached Goswick Golf Club. I was relieved. Almost as soon as I picked up the coast path signs again they tried to send me further inland so I headed back towards the beach, braving the busy (and private) golf course, and stayed close to the dunes. 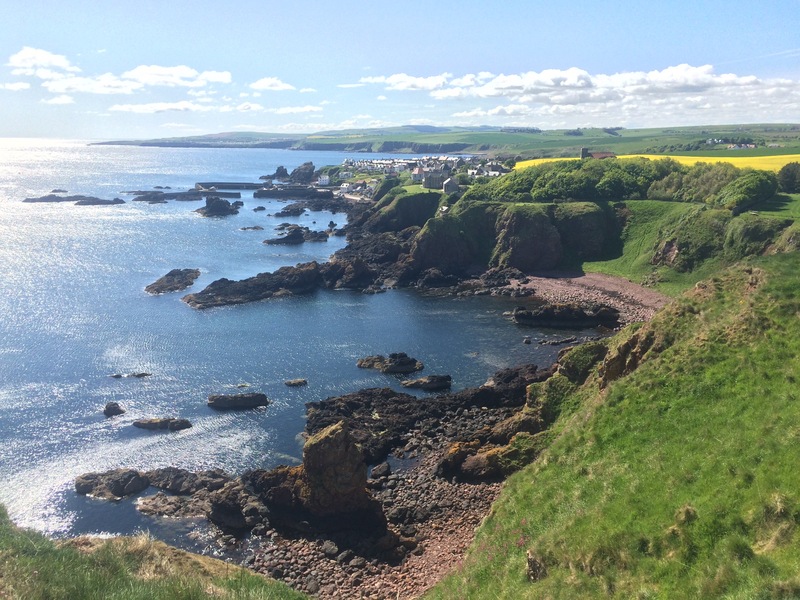 It didn’t take long before I was back on the coast path and overlooking the beautiful Cocklawburn Beach. A few families were enjoying the beach, despite the gale force winds! Chris’s friend, Ed, lives in a house overlooking the beach and had invited me in for a brew (no cups of tea in the Army, just brews). I had only walked 8 miles but was desperate for a break from the incessant wind so timing was perfect for me. Ed was out but his mum, Sue, was there and made me feel very welcome, feeding me tea, sandwiches and cake. I admired the views and watched from the window as squalls of rain came through, alternating with the sunshine, and I wasn’t keen on heading back out. Ed came back so I stayed for more tea and then, after I’d been there a good couple of hours, he offered me a lift the last few miles to Berwick as he had to go out anyway. I gratefully accepted. 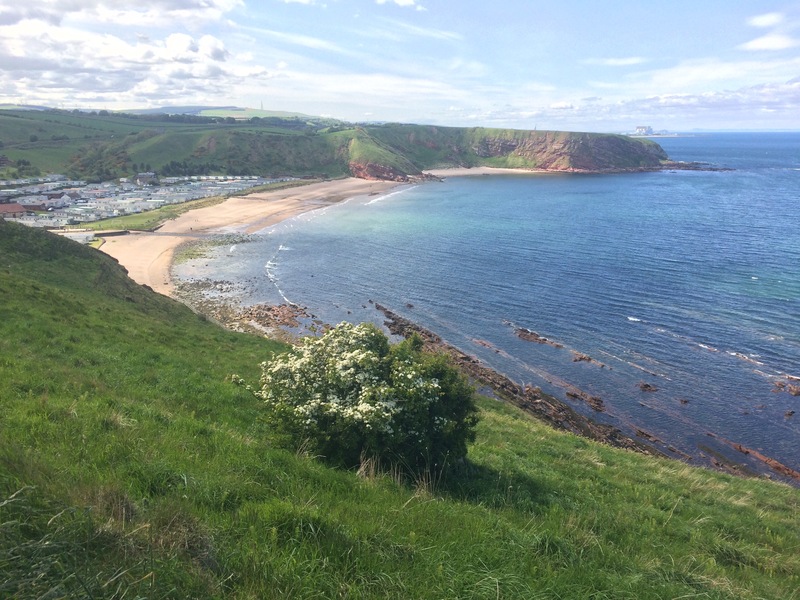 I’d had a wonderful afternoon chatting to Ed and his family and was treated to a scenic drive the long way round to Berwick to take in some of the sights. Fantastic. We drove over the Union Bridge, possibly the oldest suspension bridge in the UK, that crosses the River Tweed and so I had my first foray into Scotland. Then we drove up to the viewpoint on Halidon Hill which has an incredible vista. 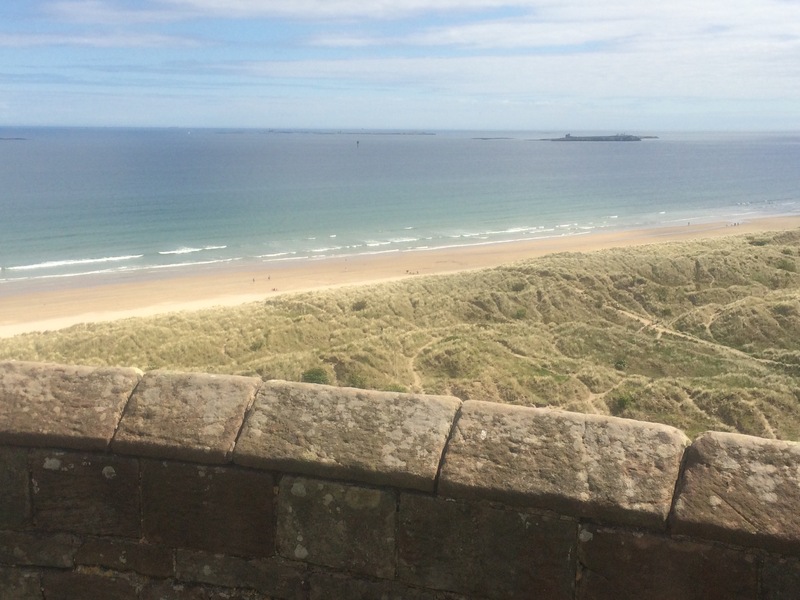 I was lucky it was such a clear day and I could see for miles; right across to the Cheviots, South as far as Ross Castle, and of course the Farne Islands, Bamburgh Castle and Holy Island. 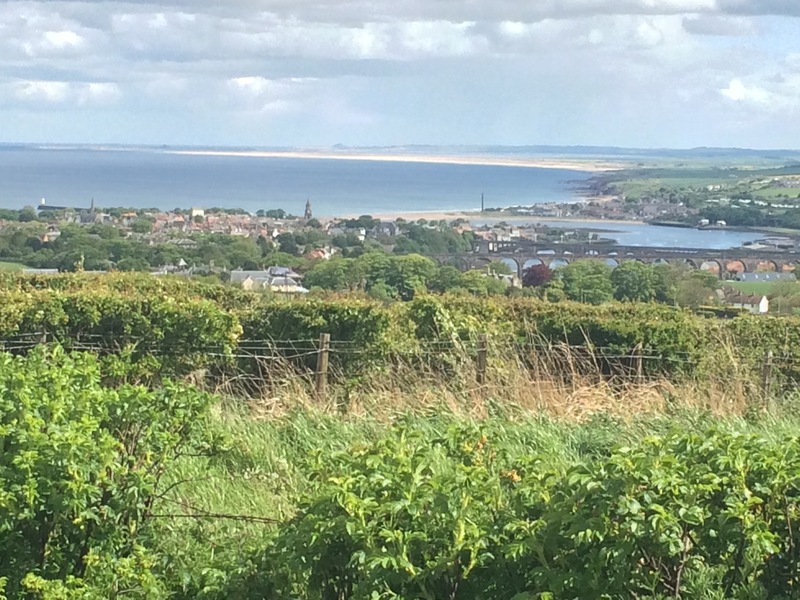 We drove into Berwick-Upon-tweed and had a quick drive around so I could admire the immaculately preserved Elizabethan town walls and see the home of Ed’s old regiment, the Kings Own Scottish Borderers. After he dropped me off I had a short walk along part of the wall to the Quayside where Clive and Yvonne have a beautiful town house with wonderful views across the mouth of the Tweed and out to sea. Clive had heard about my trip ages ago and kindly offered me accommodation, and a wonderful meal, and use of his washing machine. What a perfect ending to the day. I had a lovely evening. Yet again some very kind people had made my day by being kind to a stranger. 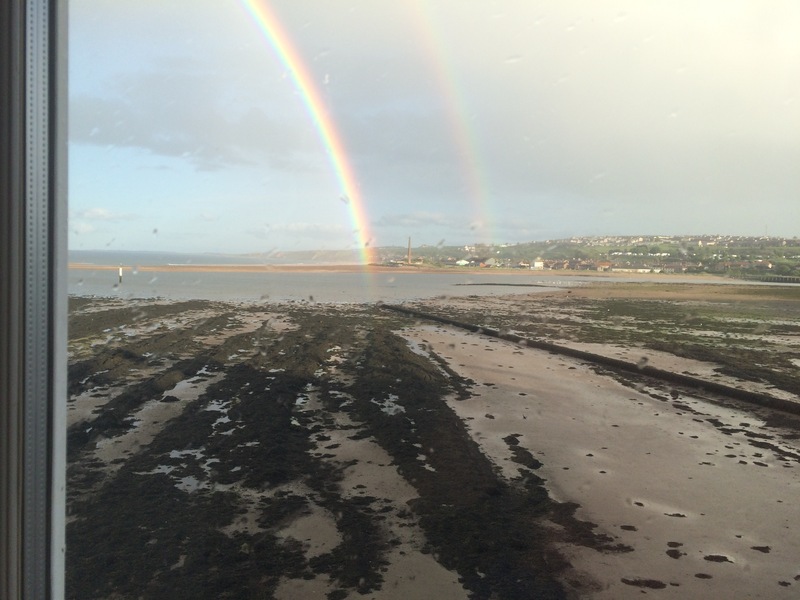 According to the tide tables safe crossings to Holy Island today were before 9 am and after 12.40 pm. Perfect for me so I was up by 6 am, as usual, and with no tent to pack decided to make tea and porridge for breakfast. The view in the morning sunshine was stunning. The walk across the causeway and then into the Holy Island village took me one and a half hours and I happened upon the post office just before 9, as it was opening. It was heartening to see all the locals coming in and the place was full of chatter. Probably because of the tide times, there were very few visitors in the morning; only about 10 cars in the car park. That meant an unencumbered stroll around the island to see the sights and read about its history. 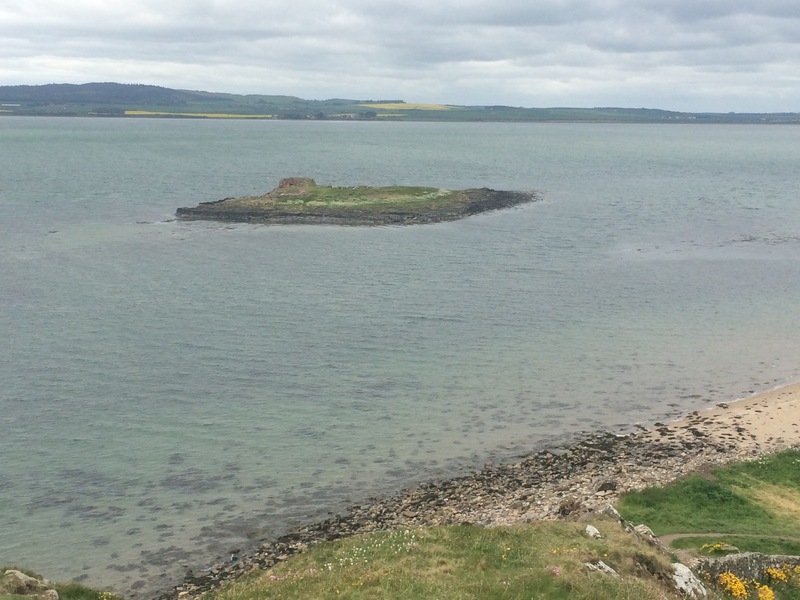 The island is an important place of pilgrimage for Christians as it was apparently where Christianity was brought to the Northumbrian Anglo Saxons by St Aidan in 635AD, and then by his better-known successor, St Cuthbert. 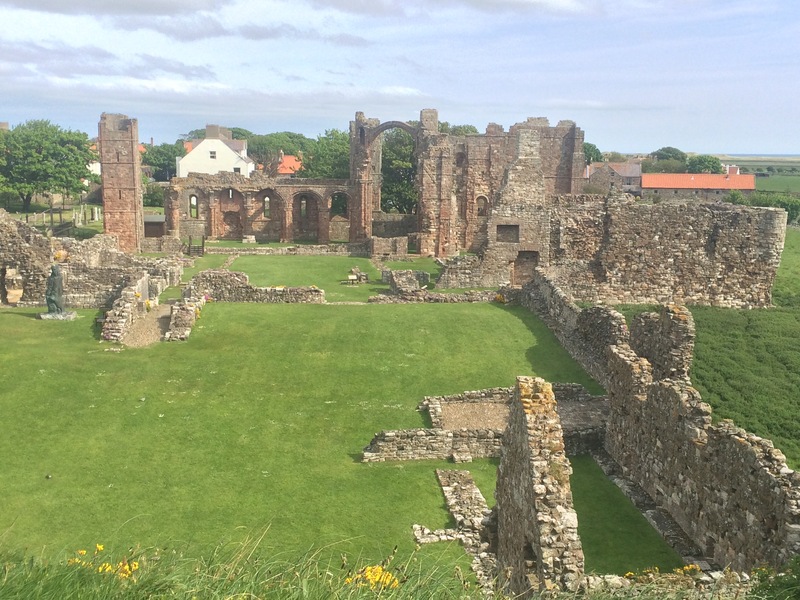 It was an important monastic site until the Vikings sacked it, but the monks came back and then there was the dissolution of the monasteries so it was destroyed again. I enjoyed visiting St Mary’s church, built next to The ruins of St Peter’s church, where St Cuthbert was originally buried. 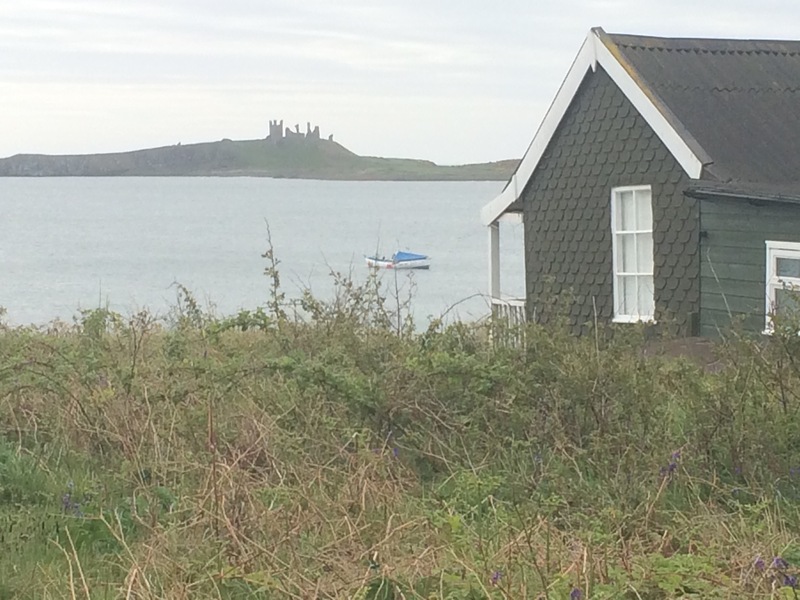 Just offshore from Holy Island is a very small island with the remains of a chapel where St Cuthbert tried out life as a hermit before he moved to Inner Farne. It is tiny! 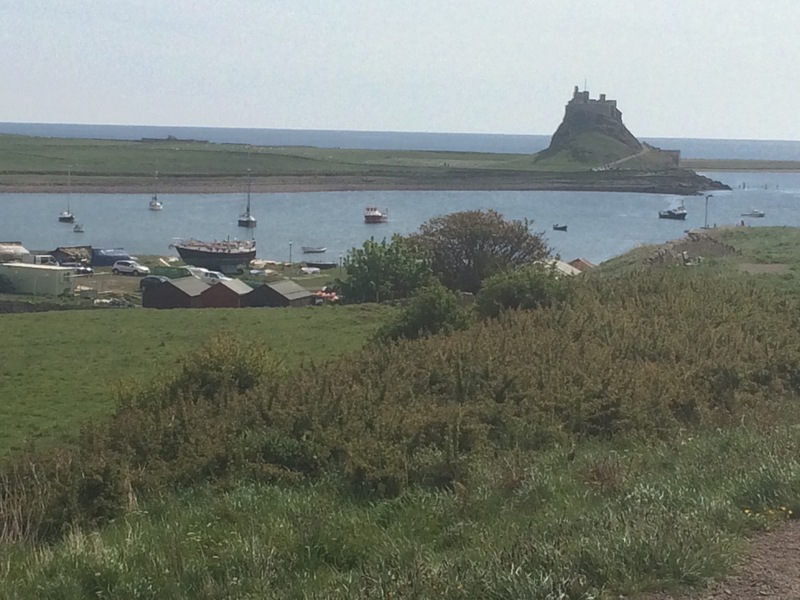 I walked around the small harbour to Lindisfarne Castle. 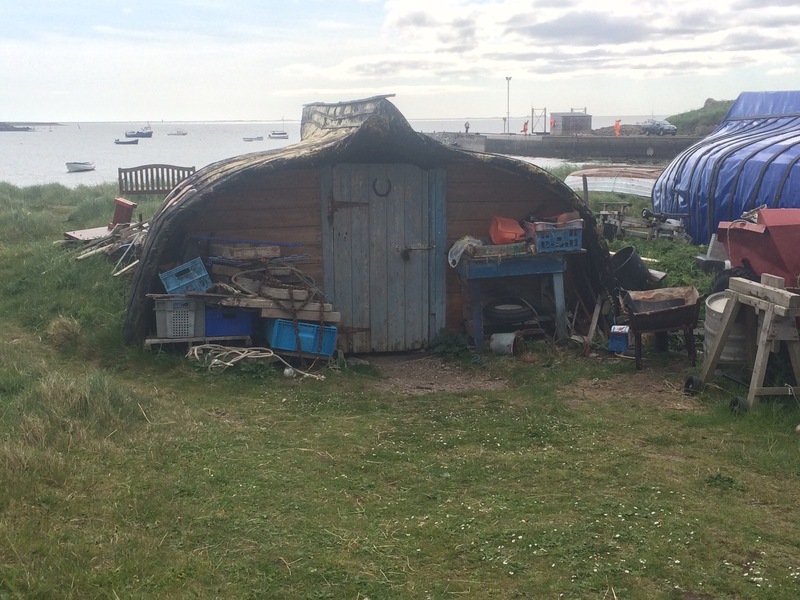 The harbour had had some quirky upturned boats that had been turned into shacks, common practice on Holy Island. King Henry VIII had the fort built to keep out the Scots and it housed a garrison for many years before it was abandoned and bought by Edward Hudson in 1901 as a holiday home. He hired the architect Edwin Lutyens (designer of the Cenotaph and Queen Mary’s dolls house) to reconfigure the castle and turn it into a quirky house. I recommend Lindisfarne Castle as a better visit than Bamburgh Castle. 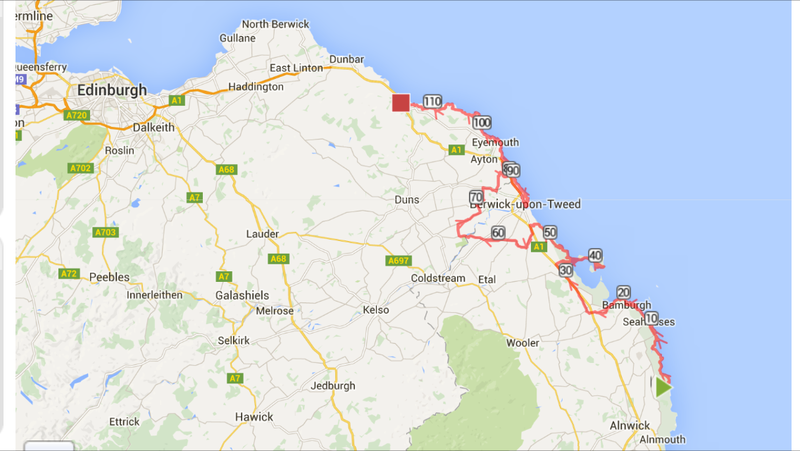 I finished off my morning with a pub dinner and then headed back across the causeway. By this time it was half an hour after the designated time for the causeway to reopen and huge numbers of people were pouring onto the island. I was walking against a tide of people and cars. So glad I went early! I just made it back to the campsite as it started to rain so I sheltered in the cafe until it shut at 5 pm. After that there was nothing for it but an early night (I didn’t fancy the wet walk to the pub). In bed by 6 then as there’s no room in my tent for sitting around. The sun was shining as I made my way back to Seahouses along the beach. It was so peaceful early in the morning. I saw 2 herons standing on rocks fishing, lots of Eider ducks (known as Cuddies after St Cuthbert) and their chicks, and there were gulls bathing in the shallows in the morning sun. 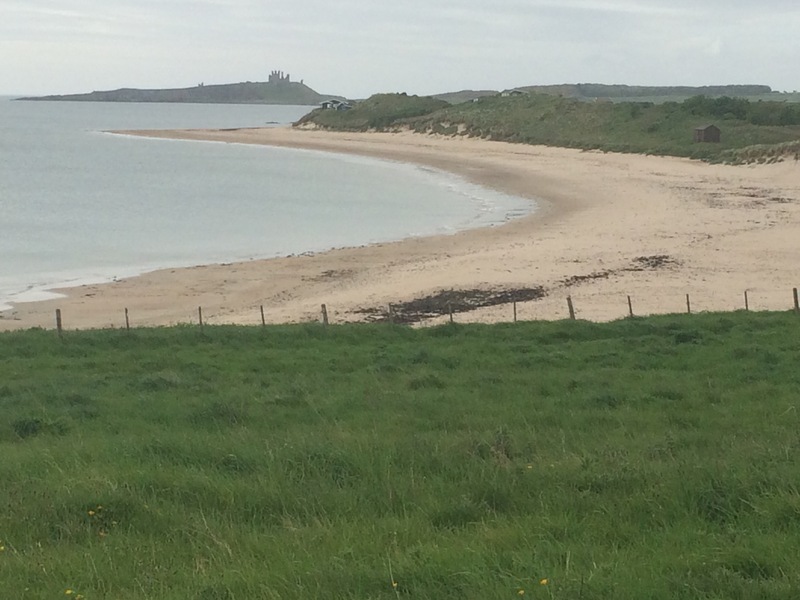 I stopped at the bakery in Seahouses again for a quick coffee and then walked the 2 miles along the beautiful beach that is watched over by Bamburgh Castle and directly faces the Farne Islands. Like all the beaches up this stretch of coast, dotted along the beach at well spaced intervals are large rock formations that are mostly covered at high tide. 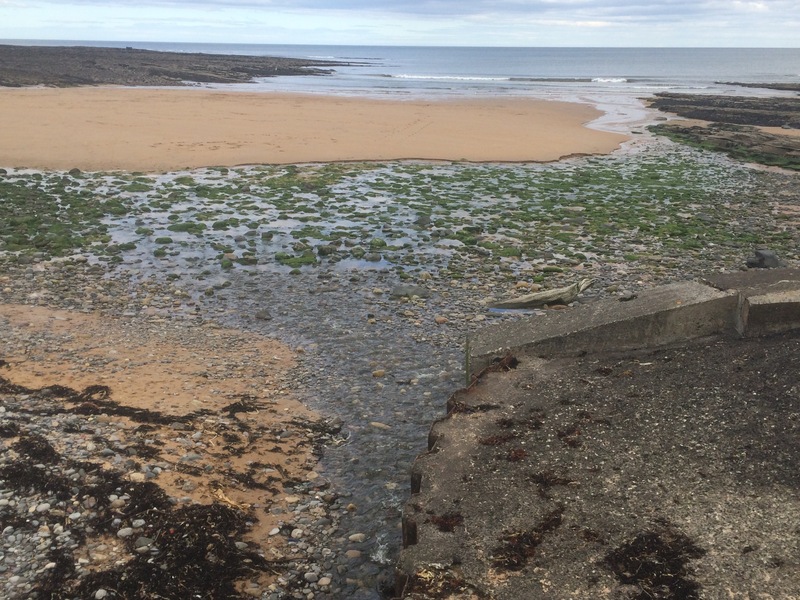 The rock pools the outgoing tide leaves behind look brilliant and I’ve seen plenty of people wading around in them with nets and buckets in hand. 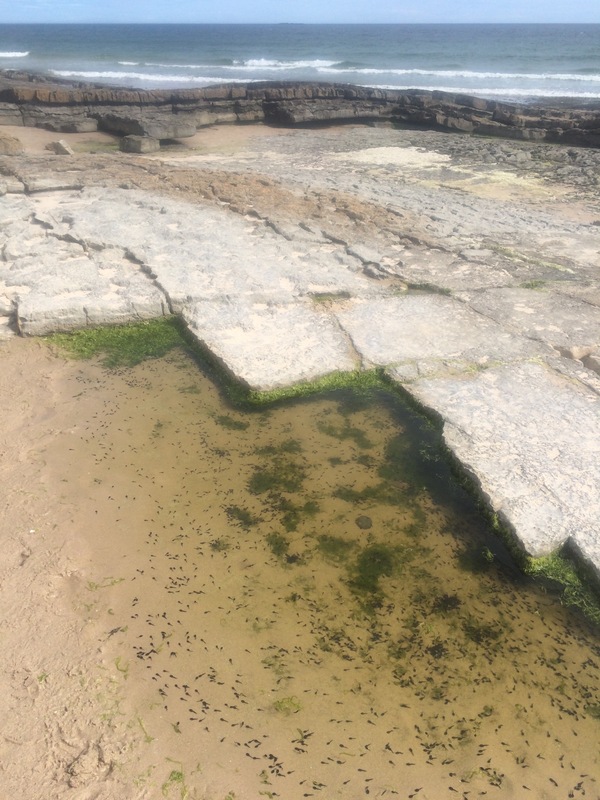 In one area, just below the dunes, there were tadpoles in saltwater rock pools. It seems the dunes are home to a colony of toads. 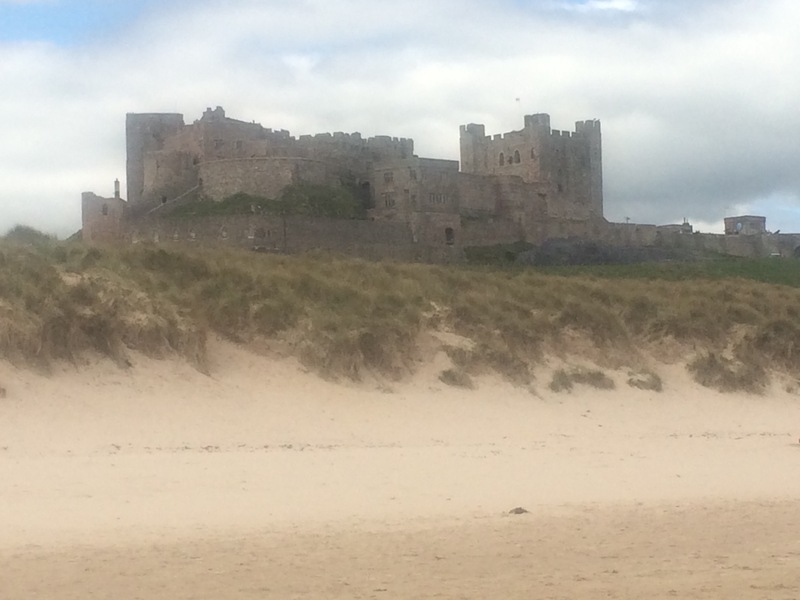 Bamburgh is an impressive looking castle and I have wanted to visit for a while so I braved the queues of foreign and English tourists. I have to say I was slightly disappointed and it didn’t live up to my expectations. It has wonderful commanding views but its history made it seem more like a Victorian folly to me. There’s not much history of it as a fort and most of it was built by a wealthy Victorian who wanted a castle. The artefacts on display don’t particularly relate to the castle either – there was some wonderful German armour and Italian swords. I enjoyed the views the best. I wandered into Bamburgh village, again braving hordes of tourists, and was delighted to have an excellent cream tea (with proper clotted cream) at one of the tea rooms. Refreshed, I walked a couple of miles around the headland to overlook Budle Bay, which is not crossable due to the Ross Low water channel. 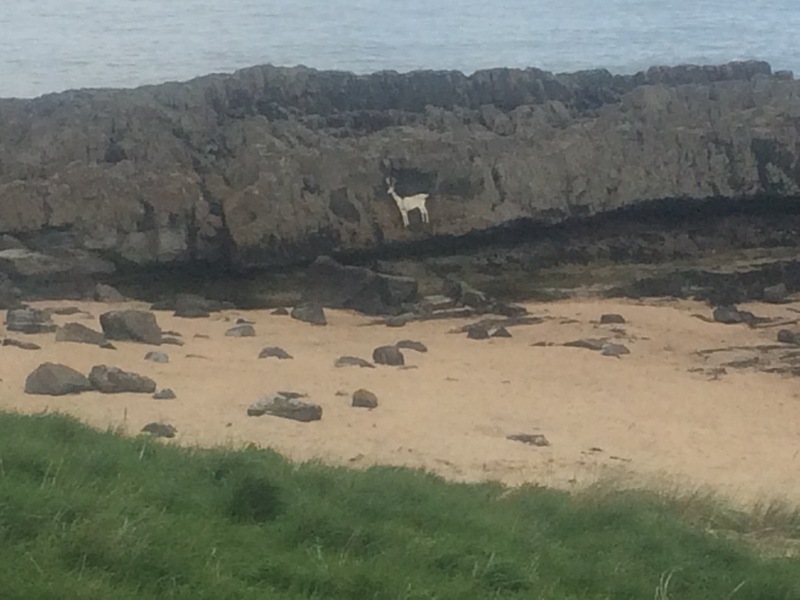 As I passed Harkess Rocks, a semi circle of rocks enclaving a small patch of beach, I noticed a white stag drawn on the rock. Rather than walk the roads around Budle Bay I caught the bus and got off almost a mile from my campsite at Beal. Stunning views from my tent, perched on the side of a hill, all the way across to Holy Island, the Farnes and Bamburgh Castle. I got chatting to my neighbours, who had just walked St Oswalds way, and they gave me a lift to the pub down the road and we had dinner together. Thanks to Mags, who has offered me accommodation in Glasgow, and to Ade and Jackie, who have offered the same N of the Lake District. It turns out Ade also used to be in the RAF so there was a bit of shop talk to be had. 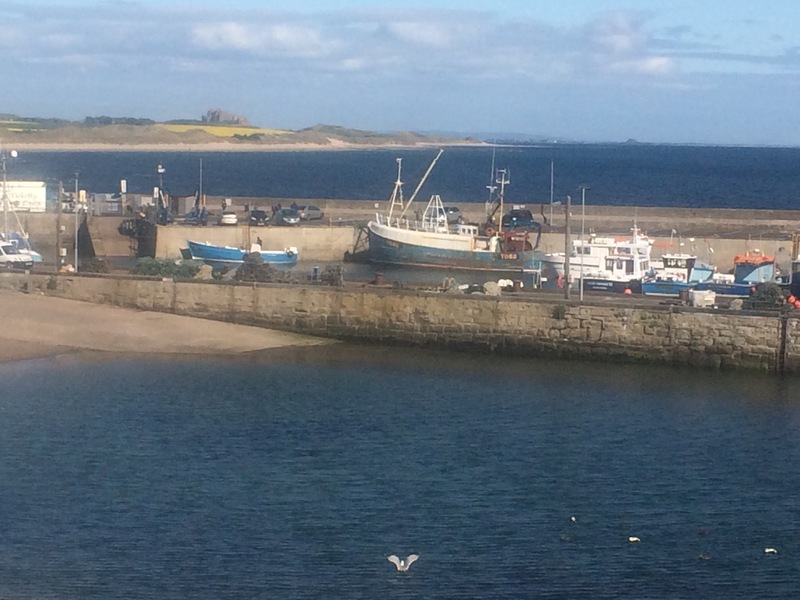 I was up extra early to ensure I made it to Seahouses in time for a boat trip to the Farne Islands. Heading back to the coast, as I popped over a small hill I was confronted with a dramatic view of Dunstanburgh Castle perched on the headland North of Craster. 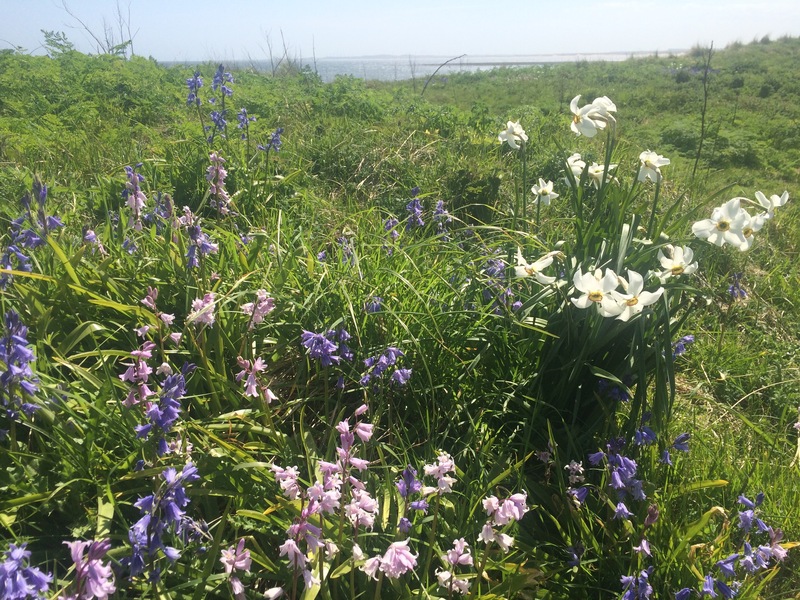 I walked along the St Oswalds Way through the dunes to Low Newton-by-the-Sea. There were some amazing looking bachs (to use the kiwi term that is so apt for these huts) nestled in the dunes. The beaches around here have beautiful soft sand the colour of vanilla sugar. I walked the last bit to Beadnell Bay along the beach and bumped into Nigel and his wife. Nigel was the only other guest at the Moonfleet in Skinningrove last week; what a nice surprise to bump into him again. I was booked in at a campsite in Beadnell Bay so by 11.30 I had pitched my tent and set off, with a lighter rucksack, for Seahouses. I had time to stop at the bakery for a coffee and the most enormous piece of quiche with at least a pound of broccoli in it (good for my vegetable count). Seahouses is a popular tourist resort, mainly because it is where the boats to the Farne Islands go from, and it was packed today. Fortunately I had booked my trip and it was definitely worth it. 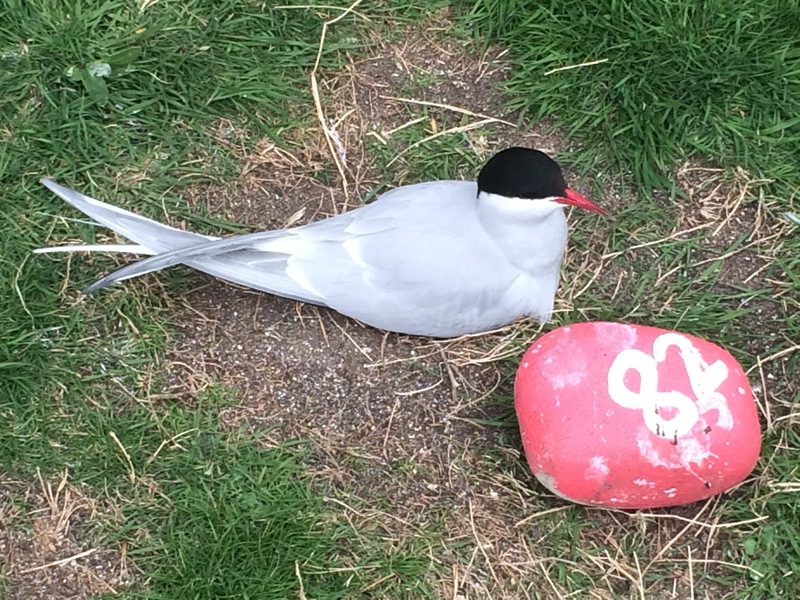 I saw lots of the same seabirds as at Bempton Cliffs: all the auks (guillemots, razor bills and puffins), kittiwakes and gulls, as well as grey seals and arctic terns. 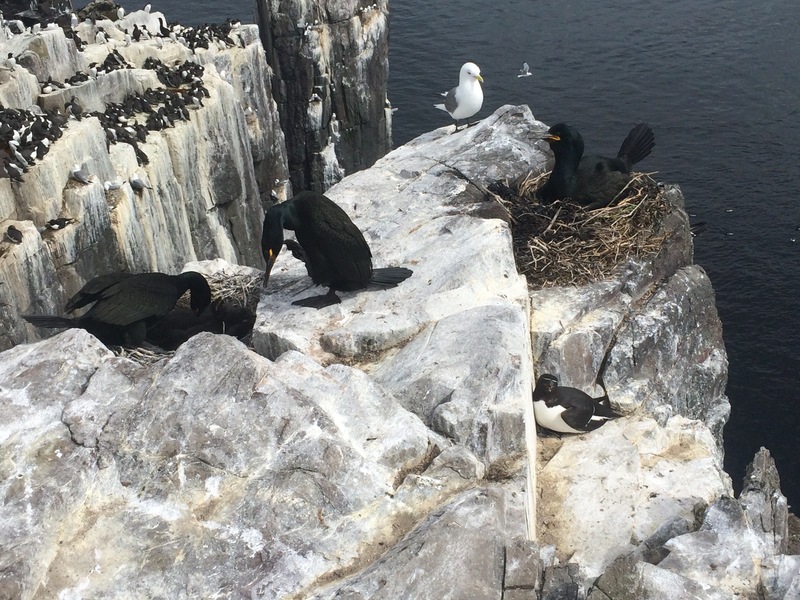 The difference was that when we landed on Inner Farne I could approach the birds sitting on their nests until I was virtually standing on them! Getting off the boat we were attacked by the arctic terns (one drew blood pecking my finger as I tried to defend my head). They were nesting everywhere, even on the path. 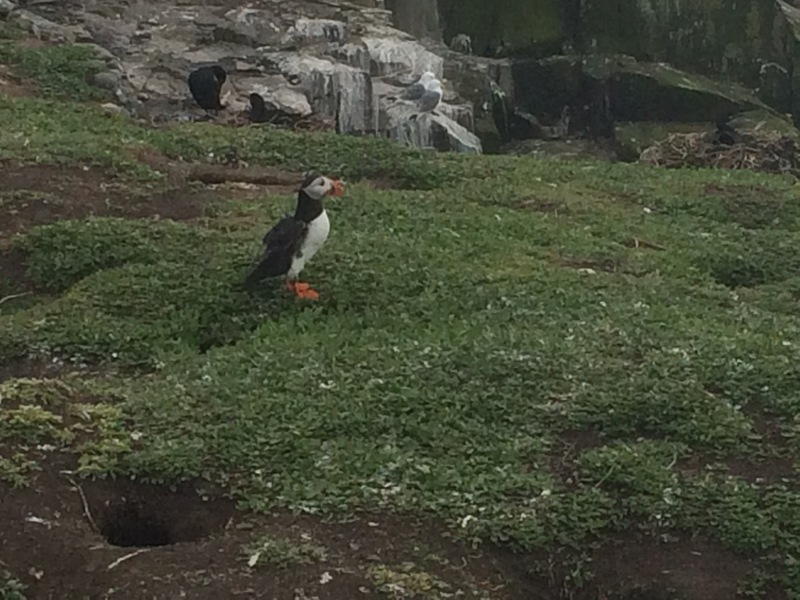 The puffins had burrows all over the island too and the other birds colonised the cliffs. Utterly amazing to see them all so close, I could have stayed for hours. 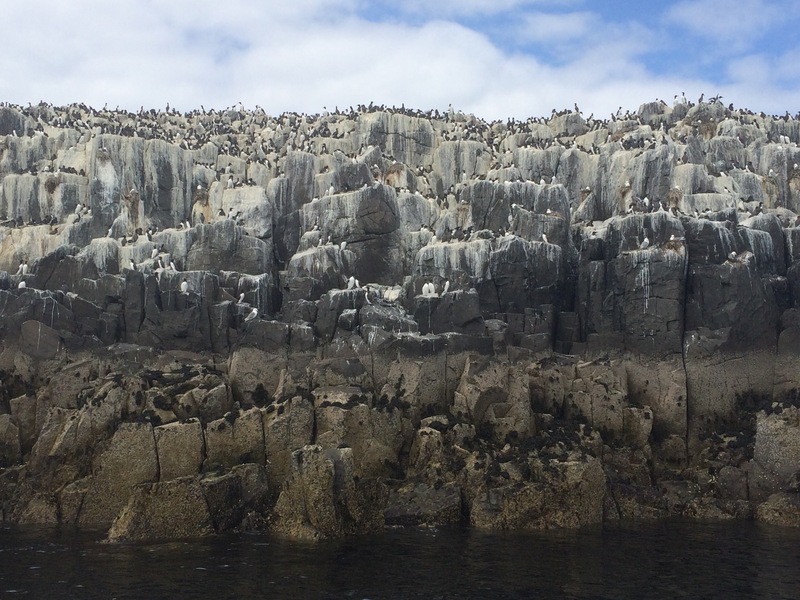 The boat trip around the Farne Islands was interesting as well. I heard about the story of Grace Darling, the first lighthouse keeper’s daughter, who rowed out to save some shipwrecked folk in a storm. And then there’s the church on Inner Farne, the home of St Cuthbert. 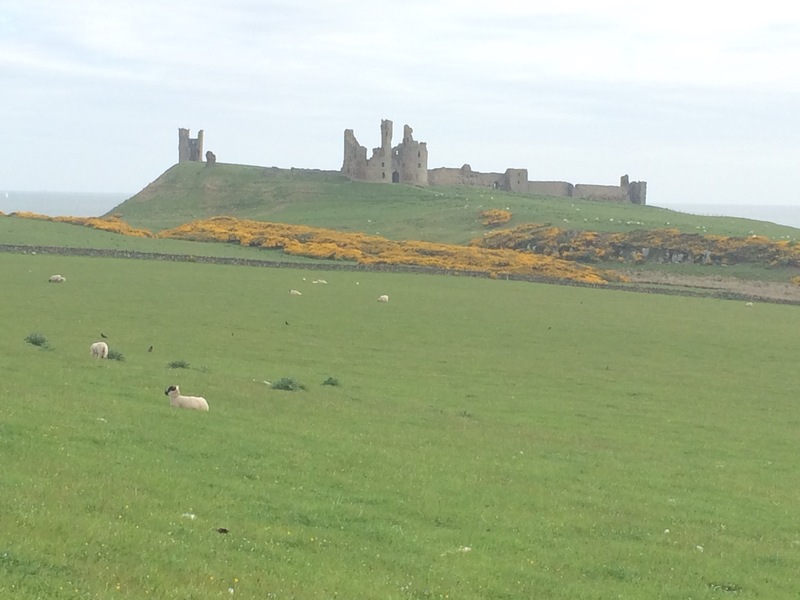 There are also fantastic views of the coast, including 3 castles: Dunstanburgh, Bamburgh and Lindosfarne. 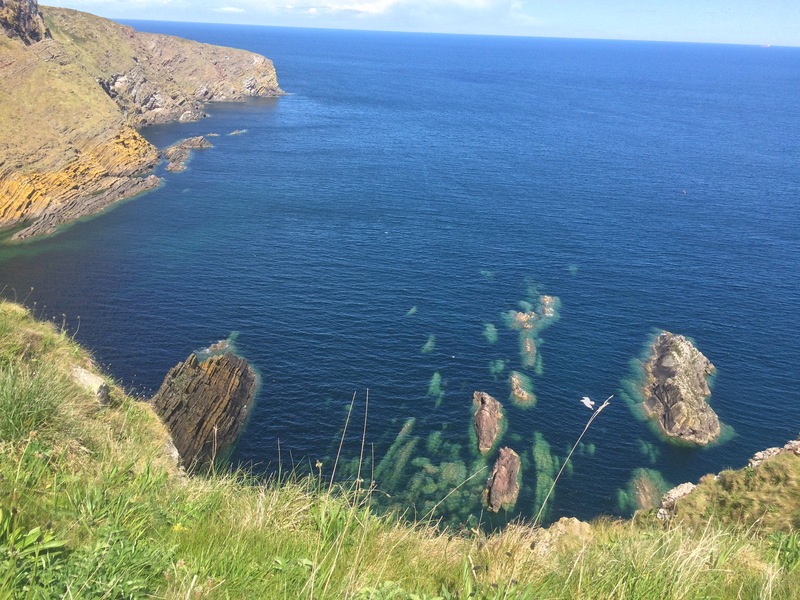 The sea looks so clear around the islands but the birds on the cliffs do smell…a lot. An industrial week bookended by the beauty of N Yorkshire and Northumberland; the meat of the week being spent in Teeside and Tyne and Wear. No camping this week as there were no campsites, and some of the weather was pretty bad anyway (huge hail stones in Middlesbrough). Staying in guest houses made for an expensive week which, considering some of the poor quality food and accommodation this week, made it particularly annoying. I also had difficulty finding much of this week’s accommodation and that meant I spent too many frustrating hours trying to plan, which is exhausting. Thursday evening was a real low point when I spent 4 hours on the internet, didn’t get any dinner and had yet another late night. It was unfortunate timing approaching a holiday area on a Bank Holiday weekend. It’s nice to have way marked paths on my route; however, there were a few this week where the signs can’t have been erected by anyone who actually walked the routes as they led to dead-ends, or were in places not clearly visible, or came after a path junction. The clear winner of the worst path of the week competition is the Teeside Way. I don’t recommend it. On the plus side, the view of Middlesbrough as I came over the cliff to Saltburn was so moody and fantastic under leaden skys, and the Durham coast is stunning, and then there are the Northumberland beaches and pretty towns. Definitely some magical moments. There has been a lot of flora and fauna on this trip and this week it was particularly good. 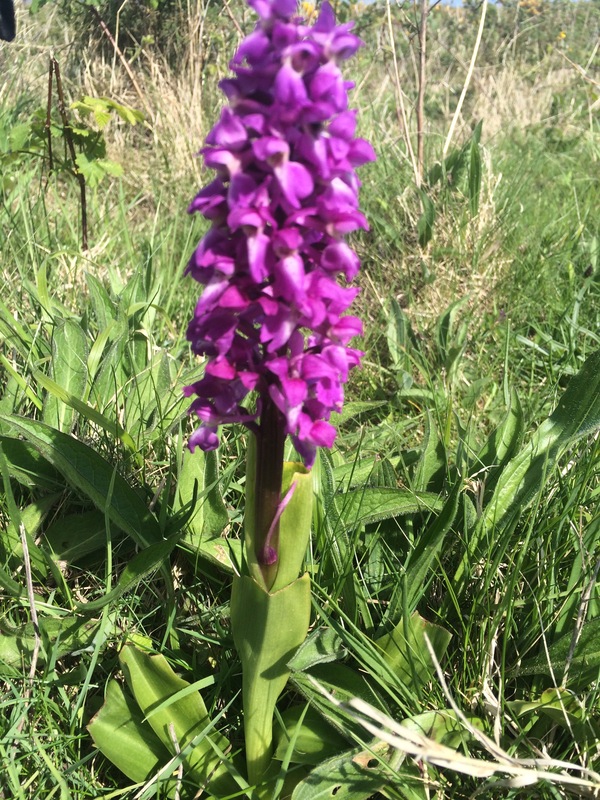 I have seen so many bluebells in the sand dunes, a Northern Marsh Orchid and plenty of wild garlic. Grey skies but no rain as I set off along the main road from Amble to Warkworth. 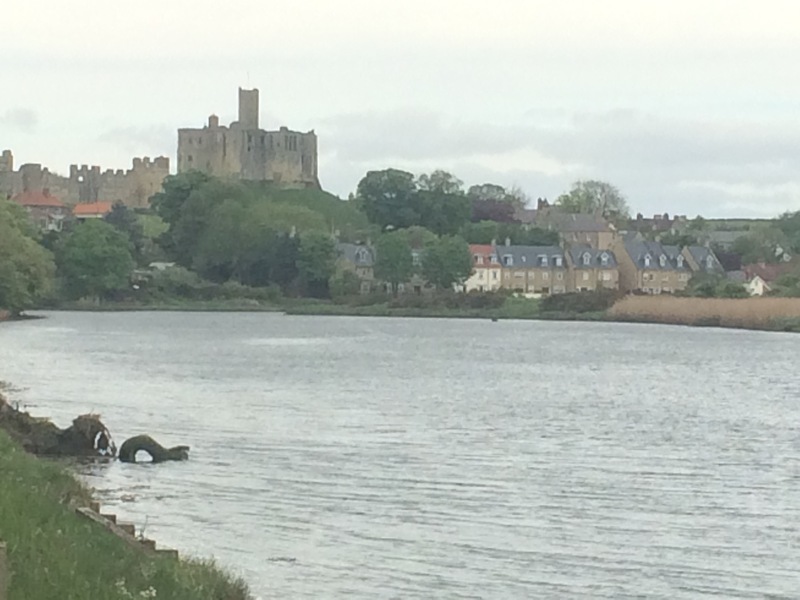 A good looking town that wouldn’t be out of place in the Cotswolds, Warkworth has a ruined castle on a hill and a 14th Century fortified bridge spanning the River Coquet. 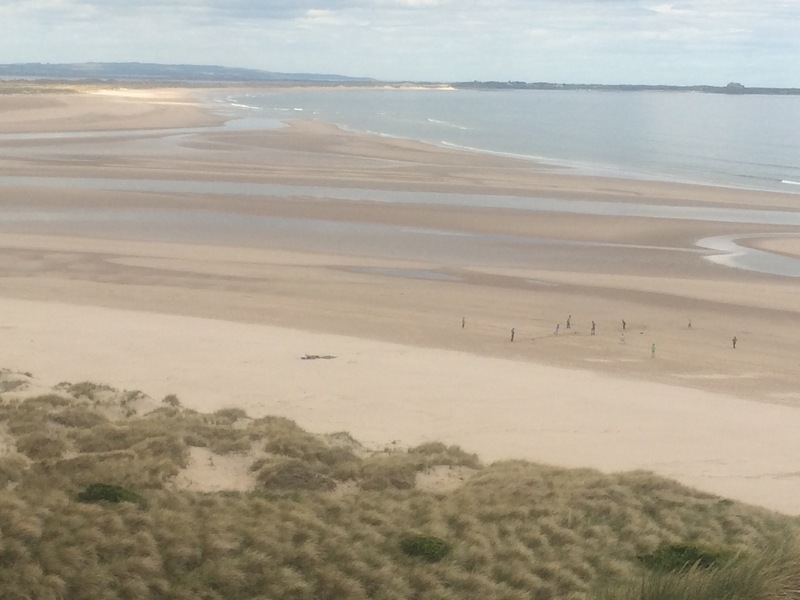 Having rounded the Warkworth Harbour I could head for the beach; another long stretch of golden sands all the way to Alnmouth (sort of). 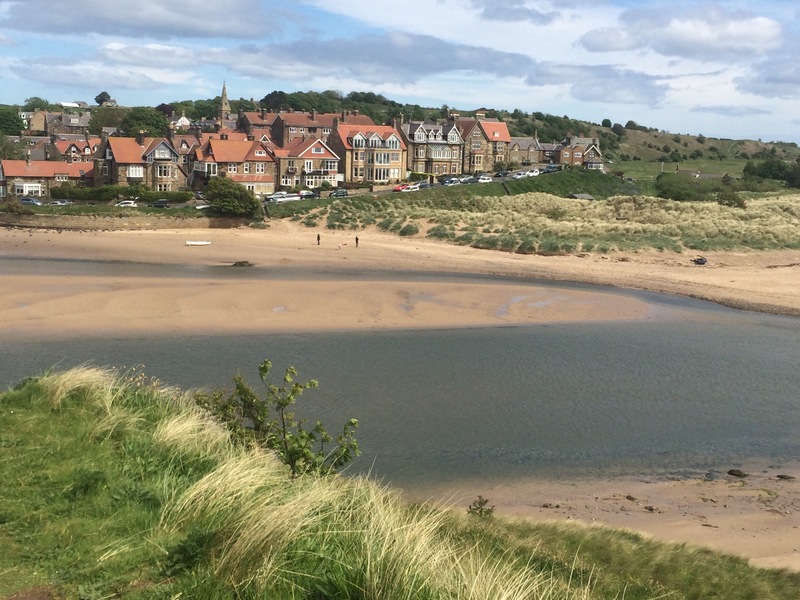 The River Aln flows into Alnmouth Bay and requires a 2 mile detour around the roads. 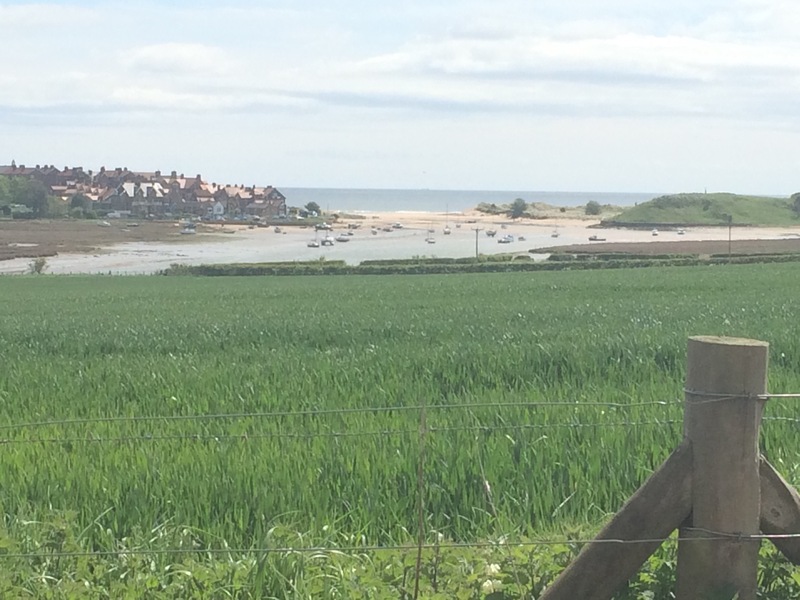 Alnmouth needs a ferry! It’s a long way around to get there! Another picturesque town and the tourists were out in force. 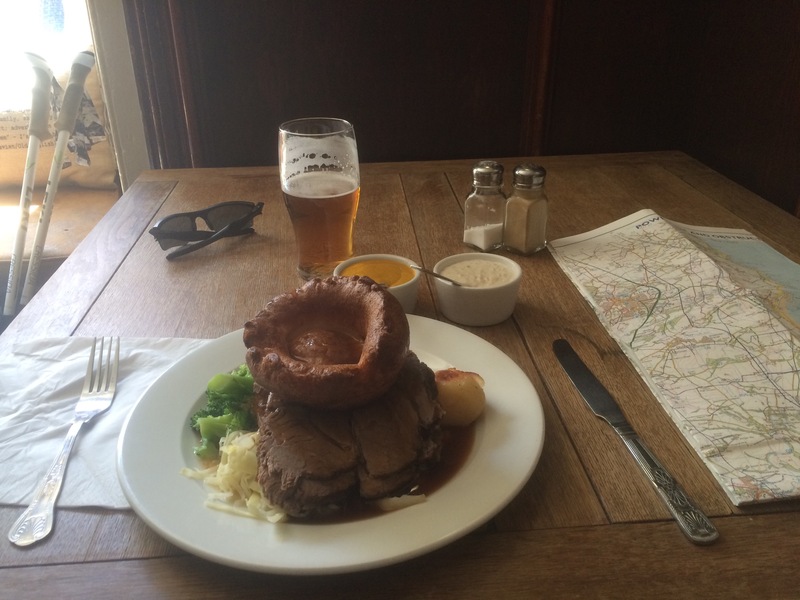 I stopped at the Red Lion Inn, as it had been recommended, and treated myself to a Sunday roast dinner and a pint. 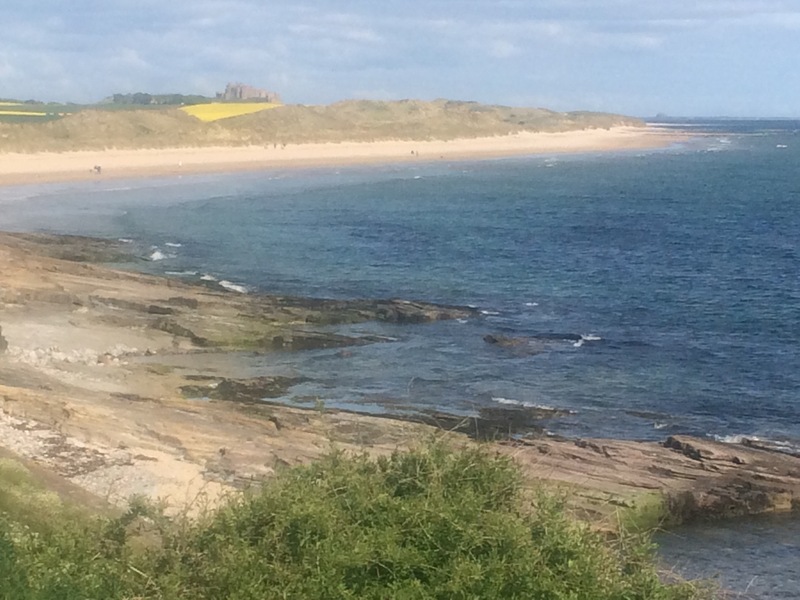 After Alnmouth I walked along the undulating headland as the beaches were covered in amazing rock formations. It must be a geologist’s paradise. I passed RAF Boulmer and then crossed a small bridge at Low Stead Links, where a stream flows into the beach and it’s a designated SSSI. 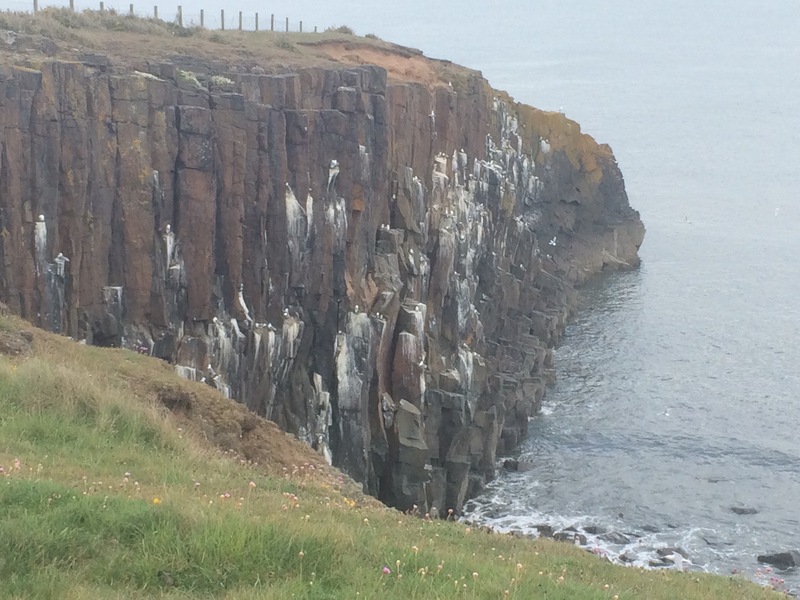 At Cullernose Point the gulls were nesting on the black cliff and covering it in white streaks of bird poo. All the way along the cliffs I had been getting glimpses of Dunstanburgh Castle looming in the distance. 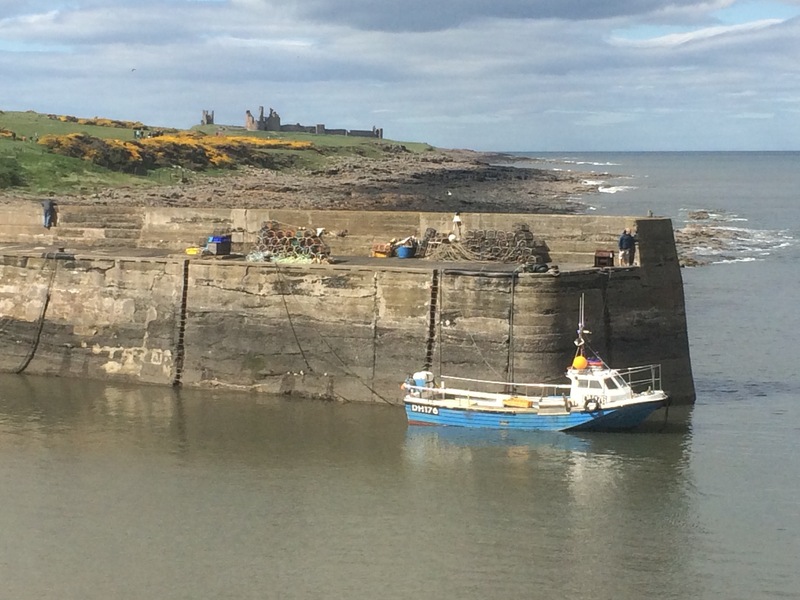 It towers over Craster, the final picturesque town of my day, which has a famous smokehouse. Unfortunately it is closed on a Sunday so no kippers for me. Back to camping tonight; it’s been a while.